Enjoy the craziest party of your life with the wildest Oceanbeat all-inclusive boat party show in Ibiza. • The boat party runs from 14:00 – 18:00 approximately. • Meeting point is at 13:00pm in the bar FOREVER just 50 meters next to the pier of Playa d’en Bossa (see map here). Please arrive at meeting point early, with your ticket (please take a screenshot of your ticket in case you don’t have a proper internet connection) and ready to board. You must exchange your ticket for a wristband by 13:30 latest. Boarding is at 13:45 sharp. Arriving on time also means you’ll get to enjoy the free champagne welcome drink with a snack. 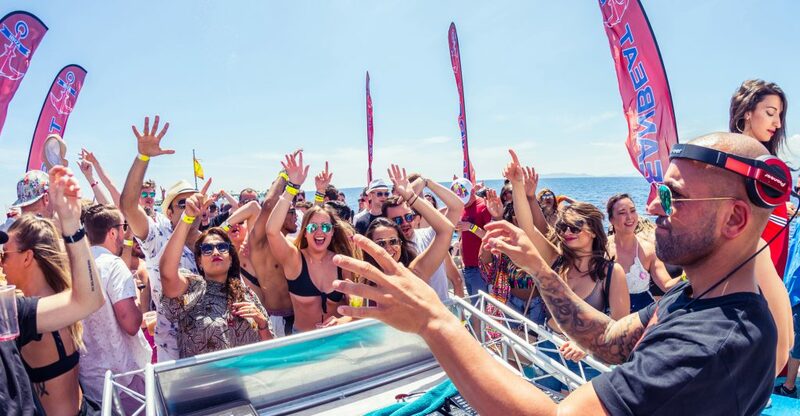 • The boat party includes open bar (soft drinks, beer, Mojitos, Oceanbeat’s iced cocktail, and sangria) as well as a swim stop (professional lifeguards on duty – swim stop availability pending on weather conditions – safety first). • Once the boat is back, the party continues at Bora Bora from 18:00 until late. Oceanbeat clients also get free entrance to various parties happening in Ibiza’s super clubs to choose from. The parties on offer may vary during the season. • If you arrive too late for redemption or miss the boat, please contact our customer service hotline. • Depending on availability Oceanbeat Ibiza can reschedule you to an event on the following days. This is a voluntary service and depends on availability. No-shows can’t be refunded. In case you’ve booked the insurance of the PROTECT GROUP during your purchase please contact the customer service as soon as possible. • Excessive drinking on a boat is dangerous. Oceanbeat Ibiza is committed to promoting responsible alcohol consumption. Any use of drugs won’t be tolerated. Anyone not adhering to this will not be allowed to board the boat, attend the after party or receive a refund. ★ = Boat Party. Click a star to select your preferred date. Please enter a valid coupon code Error with request Valid coupon applied!